Symbaroum has a simple system for handling the challenges presented to characters. When challenged directly, players roll against one of their Attributes modified by the relative Attribute of the competition. If the soldier has a Vigilant of 9, that means a modifier of +1 on your Discreet Attribute, because his perception is below average. If you’re doing something without competition, the GM has to make a call on the level of difficulty. The core book has a table to handle this, running from a Piece of Cake through to Absurd levels of difficulty, on page 101. This requires a call from the GM, probably tempered by a conversation with the player. For a gamer new to the business of gamemastery, this might pose more of a challenge as it requires a degree of comfort in handling mechanics and judging a situation. I absolutely recommend that in this instance you do consider the situation as a group and, perhaps, even make a quick note of the pros and cons that lead you to make a decision. You will find that consistency matters – and if you judge a modifier one way one session and another way later you might lose the confidence of your players. Or, less seriously, might just find yourself with increasing periods of downtime arguing the toss with the players every time their character tries to do something tricky. Most arguments will come from the fine line between Challenging and Severe – the -3 or -5 modifiers. As a GM, you might rule that a character with the standard spread of Attributes, which includes one with a value of 5, cannot even try to make a roll if the modifier cuts them down to a zero value. Now, while the Optional rules offer the possibility of Critical Success and Failure, an alternative might be found elsewhere in the Core Book that gives the mechanics of the game a little more bounce. If you’re dead set on grim and tense, Criticals might be the way to go. That moment when you know you need a 1 and only a 1 will do… well, that will have everyone on the edge of their seats. Symbaroum has a roll twice mechanic – but the mechanic doesn’t have a name. Both the rules for Blind Fighting (p 161) and the trait Pariah (p 108) use this roll twice mechanic, for example. There’s no reason why you can’t institute this more widely. In respect of Blind Fighting, the mechanic works when one side acts without sight against a sighted opponent. If the player character has sight, they attack their enemy with the benefit of an extra dice and choose the best result. If the character fights blind, they do the same but choose the worst result. The trait Pariah, common to non-human characters but also applicable to those who have grown up in a sheltered environment away from the social variety of Ambria proper, does the same thing but for wider social interaction. In either of these situations you could approach this with a modifier, but that isn’t the case. Instead, you roll twice. Anyone who plays 5th Edition Dungeons & Dragons, 7th Edition Call of Cthulhu or a few other recent systems will recognize the principle of rolling with Advantage or Disadvantage — rolling twice and either taking the best result or the worst one, respectively. However, for Symbaroum Advantage is a combat-specific rule (p 162) that comes into play if someone sneaks, attacks a prone target, flanks, etc. and increases both chance of success and damage. So… you may need to find another name for this ‘roll twice’ mechanic to ease comprehension! While you should stick to the existing system for competing challenges for much of the time, there is room to consider ‘roll twice’ as a way to apply additional modifiers. The core -5 to +5 modifiers that come from an opponent’s abilities impact the activity because they apply their personal strengths or weaknesses at odds with the character, in an attempt to stop whatever they’re doing. A sneaking character suffers a modifier to their Discreet from the enemy’s Vigilant, for example, because the enemy has orders to stop all intruders. However, if you apply a modifier because of something environmental or based on the level of preparation, you have options. In the standard approach, you could layer on an additional modifier. You might take your lead from Advantage and offer an arbitrary modifier – from +2 to -2 – layered on top. You could opt for a more narrative approach and allow the players to list the positives and the negatives, allowing a modifier of one for each. That’s a +2 on their Discreet for a total of +3 because the soldier has a Vigilant of 9. Simpler yet would be to use ‘roll twice’, applying Favor – roll twice and take the best result – or Disfavor – roll twice and take the worst result. The tired soldier and the gravel courtyard on balance cancel each other out, so you could still offer Favor to the player on the roll. Using this approach actually benefits from the GM running on gut instinct and offering Favor or Disfavor as appropriate. Listening to the plan and knowing the situation, go with your first feeling and hand out one or the other. The judgment upon Favor or Disfavor should never consider skill or expertise – that comes from the Attribute of the opposition. The soldier is always Vigilant 9, being tired happens to make the task situationally easier for the character to sneak. For non-competitive challenges, Favor and Disfavor simplify the whole business of the fine line between Challenging and Severe. If you would normally wrangle over whether a task is -3 or -5, just apply Disfavor and let the dice decide. In the balance of things, factors lie against success – Disfavor. In the balance, factors work to the character’s benefit – Favor. 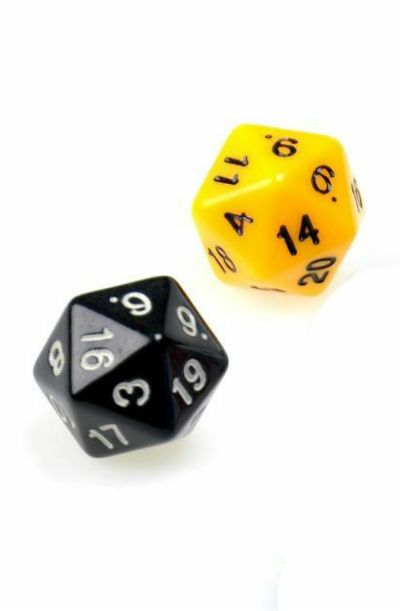 Absolutely optional, but if you do consider Favor and Disfavor as a more general option in your game, you might consider picking up a yellow dice for Favor and a black dice for Disfavor – indicating whether the light of Prios shines on the character or if they’re lost in shadow. When you rule one way or the other, having the player roll their standard d20 plus the appropriate die and see how the result plays out. It’s just table dressing, but I’m all about the bling.